Cute Pink Bride To Be badge in pink and light pink chevrons with a big pink love heart and bride to be written in a grey font in a pink and white damask frame. 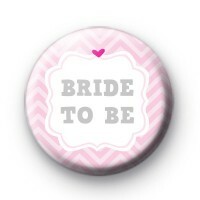 Our bride to be badges form part of our wedding party collection and can be combined with our groom, mother of the bride and a whole host of other personalised badges. You can even customise the text on this design if you browse for our personalised version, creating custom badges for your wedding day. We have hundreds of wedding badges to choose from along with hen party badges, so make your wedding day extra special with some great wedding keepsakes to hand out to your guests. Standard 25mm button badge made in our family workshop. We deliver worldwide & delivery is free on larger orders. We also offer UK next day delivery if required.